Cats can reduce stress and lift spirits, but there can be serious risks involved with keeping felines in the house. A new study from the Mayo Clinic reveals cat bites can be very difficult to treat. The calico cat was getting her regular evening petting when she suddenly bit into Ms. Briske’s right hand. The wound didn’t bleed, so Ms. Briske simply washed it out. The next morning, though, her hand was swollen and painful. She went to a doctor, who sent her directly to the emergency room. Ms. Briske spent 10 days in the hospital, where surgeons repeatedly drained and cleaned the injury. “I never dreamed in a thousand years I’d need hand surgery” from a cat bite, said the 62-year-old retiree from Rochester, Minn.
“Cat bites can be very serious, and when you do get an infection, it can be very difficult to treat,” said Brian T. Carlsen, a Mayo surgeon who was an author of the study. That’s particularly true with a hand injury because of the structure of the tendons and joints, he said. An estimated 45.3 million U.S. households had cats in 2012, up from 38.4 million in 2006, according to the American Pet Products Association. Pets may reduce stress in, and lift the mood of, their owners, some studies suggest. But a growing body of research, in fields ranging from psychology to parasitology, points to possible health concerns. 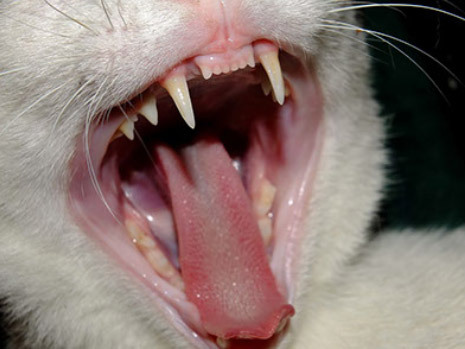 Cats’ sharp teeth often penetrate deeply, creating punctures that may not appear serious but can easily harbor bacteria that live in the animals’ mouths. Cat bites represent around 10% to 15% of emergency-room visits tied to animal bites, according to the Mayo paper. Cat scratches can also cause infections, doctors say. Dogs are involved in a far larger percentage of bite-related emergency-room visits, but they tend to pose a different type of hazard. They will often create a bigger wound, but they don’t have the needlelike effect of cat bites that can plant bacteria deep in the flesh, doctors say. For reasons that aren’t clear, research has suggested a possible link between cat bites and human depression. David A. Hanauer, an associate professor at the University of Michigan Medical School, analyzed electronic health records of around 1.3 million patients seen by the university’s health system and found that 41% of those treated for cat bites were also diagnosed at some point with depression. “There definitely is an association there,” said Dr. Hanauer. But, he said, “we don’t know why,” and the link doesn’t necessarily imply causation. The research was published in August in PLOS ONE. A number of studies in recent years have suggested a possible association between toxoplasma infections and an increased risk of serious psychological issues in humans, including schizophrenia and suicidal behavior. “There’s moderate evidence” of a link, said Robert H. Yolken, a professor at Johns Hopkins University who co-wrote a 2012 analysis examining research on toxoplasma and schizophrenia. One possible reason is that the parasite might boost the presence of the chemical dopamine in the brain, he said. Also, he said, any potential impact is likely more significant if the infection occurs at a young age. Animal experts say proper precautions should minimize health risks from owning a cat. “The presence of a cat in the house poses very little risk” for toxoplasma infection, said Jeffrey L. Jones, an epidemiologist at the Centers for Disease Control and Prevention. People shouldn’t get infected if they are careful with litter boxes and wash and thoroughly cook their own food. “If you practice good hygiene, you’ll be fine,” said Aaron Glatt, an infectious-disease specialist who is chief administrative officer at Mercy Medical Center in Rockville Centre, N.Y.
One possible health benefit of cat ownership: a “pet protective effect” against allergies and asthma, which has surfaced in some studies. Kids who grow up living with a cat appear “less likely to develop allergy” to the animals, which, like other allergies, can be a trigger for asthma, said Matthew S. Perzanowski, an associate professor at Columbia University’s Mailman School of Public Health. Humans can avoid other cat-related health problems by treating the animals properly to reduce the danger of attacks. For instance, if a cat shows signs of stress, such as putting its ears back, lashing its tail or crouching, people shouldn’t approach it and should make sure it doesn’t feel trapped, said Katie Lisnik, an official with the Humane Society of the United States. Indeed, Ida Lyke blames herself for the bite she got from her cat Sylvester. After she broke up his fight with another cat, Ms. Lyke, who lives in Claremont, Minn., and was also part of the Mayo study, tried to pick him up. He latched onto the bottom of her right hand. Ms. Lyke ended up in the hospital with a serious infection. Still, the 79-year-old kept Sylvester after the incident. “He was just a lovable kitty,” she said.